It is often interesting to see how your home country compares in broadband speed terms worldwide. Last summer we looked at the 2018 Worldwide Broadband Speed League - with the UK's position highlighted, and a newly published world ranking table shows a similar middling result for old Blighty. The Global Broadband Index is compiled by the meerkats at Compare the Market (via ISP Review). Rather than pondering over the whole world, this survey considers 54 countries defined by the World Bank as a ‘high-income economy’ (excluding territories), discounting smaller nations for which no published data was available. It adds in data from Cable.co.uk's worldwide pricing, the Speedtest Global Index, plus Netflix's 1hr HD video download stats. 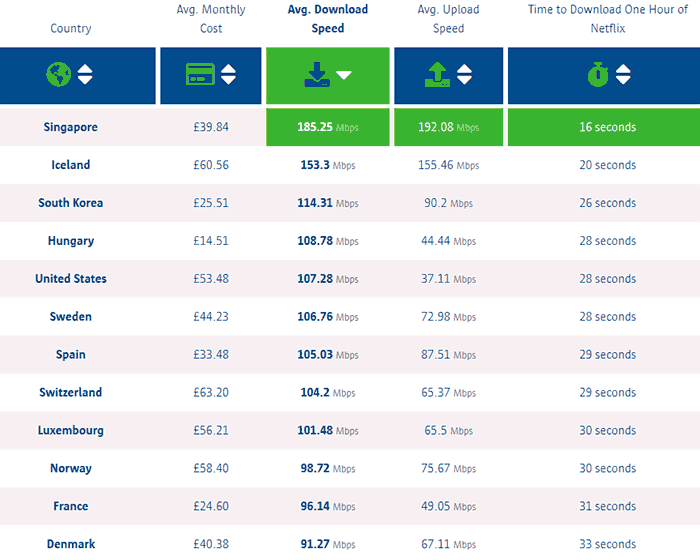 In my cropped chart featuring the top 12 countries for broadband download speeds, above, you won't see the UK. The UK is placed 27th out of 54 in this chart, rubbing shoulders with Ireland, Poland, and Chile. The UK's stats are; average monthly cost of £31.27, with download speeds of 55Mbps, uploads of 12.72Mbps, and the average Netflix 1hr HD download taking 54 seconds. You will see that Singaporeans enjoy an enviable spot in the table but their broadband average price is nearly £40 pcm. However, Hungarians enjoy a very good internet 'bang-per-buck' with the average £14.51 pcm yielding an average 108.78Mbps down / 44.44Mbps up. Fibre rollout takes time and any new technology or technique that can improve in this deployment would be welcome, not just in the UK but worldwide. An interesting new kind of cabling is being tested in Leeds which facilitates rollout up to 5X faster than when using conventional fibre cabling. The technology involves a new ribbon cable which allows engineers to join up 12 fibres simultaneously, reports ISP Review. This is said to make joining up lengths of cables much faster. Furthermore the new cable can be air-blown down conduits, rather than pulled through - facilitating longer spans and reducing labour and possible disruption. An Openreach engineer told ISP Review that "Getting new larger fibre count cables through busy city centres where access is difficult and where ducts are already often nearly full is a real headache for our operational teams. We expect this cable to take a lot of their pain away. All this means we will be able to build our big fibre spine networks to support Full Fibre ambitions more quickly and more efficiently". 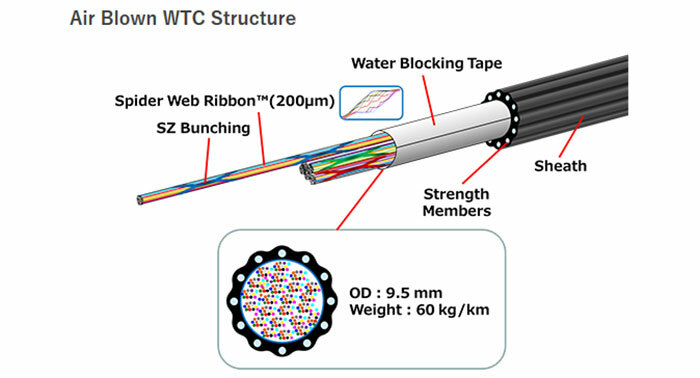 The Air-Blown Wrapping Tube Cable (AB-WTC) has been created by Fujikura Europe. According to the maker, a cable blowing machine can blow up to 60m of fibre per minute. Previously, air-blown cabling was limited to containing up to 276 fibres, this new design can pack 432 fibre in a 9.3mm diameter. Furthermore, it is estimated that the new cabling can be blown for 2km+ between joints. Singapore - a city-state where people live in very large appartment blocks so getting a few hundred meg is easy if the building is getting a gig. A lot of the rest shown there have higher averages for the same reason as Singapore - much higher propertion of appartment block acccomodation. We've got gigabit connections to many such block in London now with it being pretty standard in new higher-spec blocks. Another thing for blighty is it's fast enough for most people - as long as iplayer works and people can browse tinder/facebook they are happy. Define “most people”. It's highly subjective if OpenReach provide adequate speeds, personally I think they're positively antiquated compared to what Virgin provided me more than 10 years ago. What about Sweden and Spain then. About one third of the population live in the capital. I am on Fiber and get 18mb down and 1mb up, it's shocking how bad broadband can be.